Yesterday was a landmark day here in the United States. We actually appeared united. 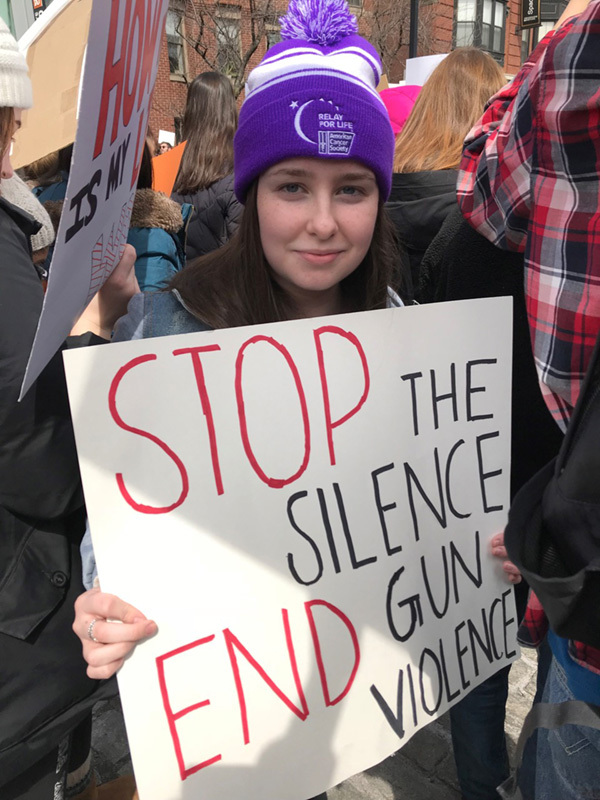 Hundreds of thousands of people marched to end gun violence, inspired by the survivors-turned-activists of the Parkland, Florida massacre. As I watched the footage from around the country, I was so impressed by the slogans and speeches. As someone who teaches writing and public speaking, I have to say this generation seems way ahead of the game when it comes to delivering a passionate message. While children are our future, these kids are our “right now” and they’re doing a fine job of finding their voices and taking a stand for what they believe in. Children live close to the bone. They haven’t been well trained to keep the peace by being nice, yet. They haven’t lived long enough to learn how to buckle under the weight of guilt or social pressure. And there’s still time before they get lulled into tolerating the things they feel helpless to fix. When I saw a picture of my niece, Amanda, standing in the crowd, I felt angry and inspired. These kids aren’t sitting on pins and needles in their classrooms. They’re seated on stakes and daggers. I can’t imagine what it must be like trying to learn algebra or American history with one eye on the door and both ears finely tuned to loud noises. Who can live, let alone learn, when the mind and body are under this kind of assault? I don’t have children. But I have more than twenty nieces and nephews and plenty of friends with kids. My work over the years has been primarily with adults because I’ve learned that our choices directly impact children. Our kids inherit our beliefs. They inherit our tolerances, our fears, and our aspirations. They learn by watching what we do far more than by listening to what we say. As I stared at Amanda, I thought about the places in my life where I still shy away from speaking up. There are people and circumstances I tend to judge rather than learn from. And I hate to admit it but I can still give in to pressure when faced with the anger or judgment of others. And I’m fifty-eight for crying out loud. If we don’t find our voices, how will these kids find theirs? If we can’t stand up for ourselves in everyday life, how will they learn to stand up for themselves? And if we can’t say “enough already” to the things that must change, honestly, we’re all screwed. This week, as I stared into the eyes of this young, brave angel, I made a silent promise to do better. Yes, silence about the things that matter is dangerous. P.S. – I’ll be speaking at the “Conversations Among Masters” coaching conference in New Orleans on May 20th – 23rd. This is a top-notch event for professional coaches and you can learn more about this event here and get a special discounted rate here.